Love this saddle. Yes, it is synthetic. Yes, it is less than $1000. It is still my favorite saddle. Before this saddle, I was riding in a stubben Edelweiss, before that 2 other stubbens and a Courbette Alpina. I bought the stubben Edelweiss and what I did not like was that the gullet narrowed towards the cantle. I think that was bothering my OTTB. So I wanted a saddle that had a consistent wide-ish gullet width and if I could change the size of the front gullet, that would be ideal. I picked the Wintec pro jump in that it has a more jumper, close contact like look, it has an adjustable front gullet plate, and it has suede! I love suede and since I cannot afford real suede, this was the next best thing. My OTTB is 7 years old, I got him when he was 5 and he was race horse fit. Looked like a greyhound. I knew his shape would be changing and wanted some flexibility with my saddle. I thought my 32" stubben would allow for some body changes but it did not. I also was having a terrible time keeping my leg solid and still with the stubben. I kept swinging it back and began to think there was something wrong with me.... until I rode in my instructors saddle and had no issues with my leg position. 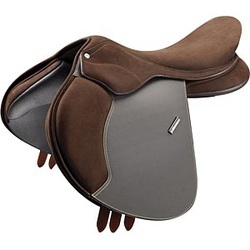 Thus I went on a new saddle hunt and found the wintec pro jump. 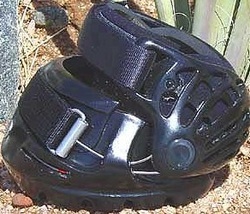 Pefect fit for me, comfortable and helps me feel secure when my green bean OTTB decides to jump BIG! I am truly amazed. I never thought a bridle would have such an effect but this one does and it is good! I am a bit of a pessimist when it comes to things that claim to be better than traditional so was doubtful of it being better than a regular bridle so I bought the tobacco color, small horse ( which was on sale, 1/2 price at the time). My TB was better instantly. No head flipping, downward transitions with no drama, he now listens to my body since not worried about his face thus rein pressure is slight. I did buy the small horse size and it fit but barely. So 2 weeks later, I bought the standard horse size in the havanna. Love, love it! I am still amazed how well my horse does. I keep the flash like piece loose ( he happily eats grass with it) and use it with my happy mouth jointed snaffle. Zero head flipping with this bridle. I am still amazed. We can do our jumper course, lines included and he is focused. And I am riding with a fairly loose rein . Just minimal contact for helping him to collect and get the hind end engaged. He now seems to focus on my body aids much better. We can turn, tight turns, without rein pressure. He has never been this relaxed before the Micklem. I cannot explain it but for my OTTB, it works. I prefer to let my horses stay barefoot. I put shoes on when needed. My jumper, I put shoes on him around May, take them off after the last show in October. Since the ground at the various show venues we go to is questionable, shoes are needed. Not so much the nice sandy arenas, but getting to the arena. Stray gravel pieces, pavement, etc that can be ouchie to the barefoot hose.